It has been used as a motto for instance by Francis Bacon as well as Robert Peary. It still is popular in social, educational and military organisations. In first person plural, the quote is written on an iron arch over the class of 1893 memorial gate at the University Of Pennsylvania. 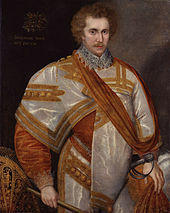 A painting in the National Portrait Gallery, formerly attributed as Sir Philip Sidney and now thought to depict his brother Robert, is adorned with the phrase. In The Dunciad, Alexander Pope writes of John Henley that he "turned his rhetoric to buffoonry" by handing out medallions engraved with this motto. ^ Stone, Jon R. (2004), The Routledge Dictionary of Latin Quotations, Routledge, p. 140 . ^ Reid, Thomas; Walker, James; Hamilton, William (1850), Essays on the Intellectual Powers of Man, J. Bartlett, p. xii . ^ Cf. Chigwell School, Holton-Arms School, Capitol Technology University, South Ural State University, Combat Logistics Battalion 24, Rhodes Knights, Croxley Green#York House School, St. George's Girls' School, Center for Explosive Ordnance Disposal & Diving. ^ Gavin Alexander: Writing after Sidney. The Literary Response to Sir Philip Sidney 1586–1640. Oxford University Press, Oxford, New York 2006, ISBN 978-0-19-928547-1, p. 158, n. 40. ^ Pope, Alexander (1736), The Works of Alexander Pope, L. Gilliver and J. Clarke, pp. 206–208 .